A very easy and convincing Double Lift, almost infallible even in clumsy hands, which is done under cover of a spread deck. As straightforward as this is, we have been unable to find it in print. Stephen Minch kindly informed us of a different technique developed by Roberto Giobbi in 1994 and is included in Card College, Vol.5. It was discovered that Frank Zaks had derived an almost identical handling which appears on Daryl's Encyclopedia of Card Sleights, Volume 5 video. a) This Double Lift can be done in a variety of situations in which the deck is spread. For example, thumb-riffle down the deck until a spectator stops you. Turn the top half face-up legitimately to mark the point where the spectator stopped. Spread the face-up cards until you come to the face-down section, and let the top cards of the face-down section spread a little as well. b) Your right hand, holding the face-up spread, uses it to tap the top face-down card for emphasis (Fig.1). The right fingers go under the top two face-down cards, which are turned over on top as one. 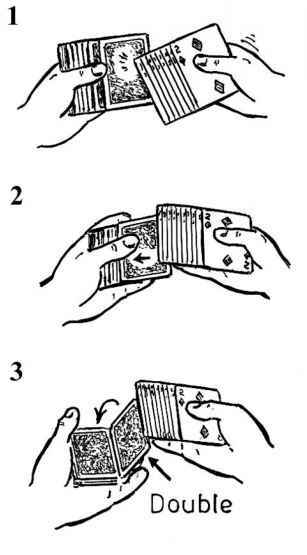 In the process, the right fingers move the upper card of the pair to the left until it's roughly aligned with the next card (Fig.2), then flips them both over together (Fig.3). This is similar to the movement in Robverse. after the turn-over. The right hand continues to hold the face-up spread during this process. c) To turn the double face-down again, your right fingers go into the natural break between the two face-up cards and the face-down deck, and again the right hand levers the two cards over as one. 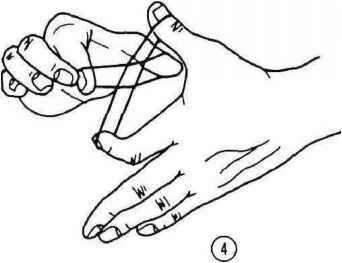 The left hand then immediately pushes off the top card to be taken away, or whatever else you want to do with it. Or a more direct use: Simply spread the deck until a spectator points to a card. Take the cards to the right off with the right hand, retaining the spread, and again tap the top card to emphasize this is the one chosen. Then turn the top two cards over as one, exactly as above.